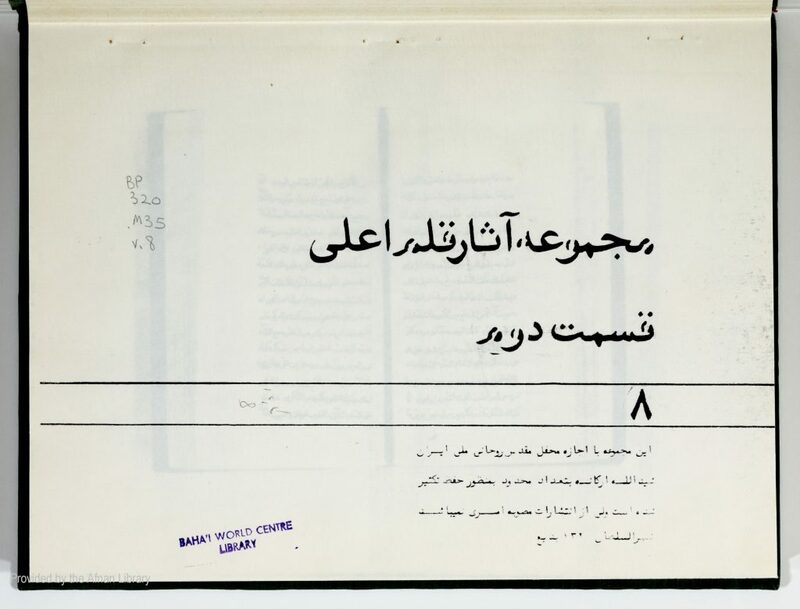 Description: Second part of a collection of Tablets by Bahá’u’lláh (page numbering runs on consecutively from previous volume, INBA vol. 7). Most of the individual Tablets have the addressee indicated (either at the beginning or in the text) and most are dated. All of the dated Tablets fall in the period 1295-1298 AH (1878-1881 AD). Two separately numbered fascicles are attached to the end of this volume. The first of these is the Tafsír Hurúfát al-Muqatta`ah (Tafsír Ayatu’l-Núr) (p. 142 of PDF). The second consists of the Tablet of Bahá’u’lláh for the Holy Day of the Birth of the Báb (p. 158 of PDF). Manuscript, p. 315-p. 585 + 33 + 10 pp. (162 pp. of PDF).